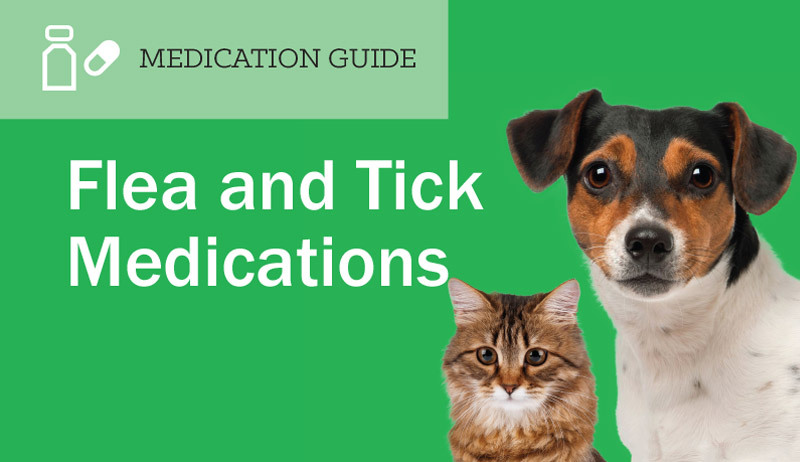 How Do Flea & Tick Medications Work? 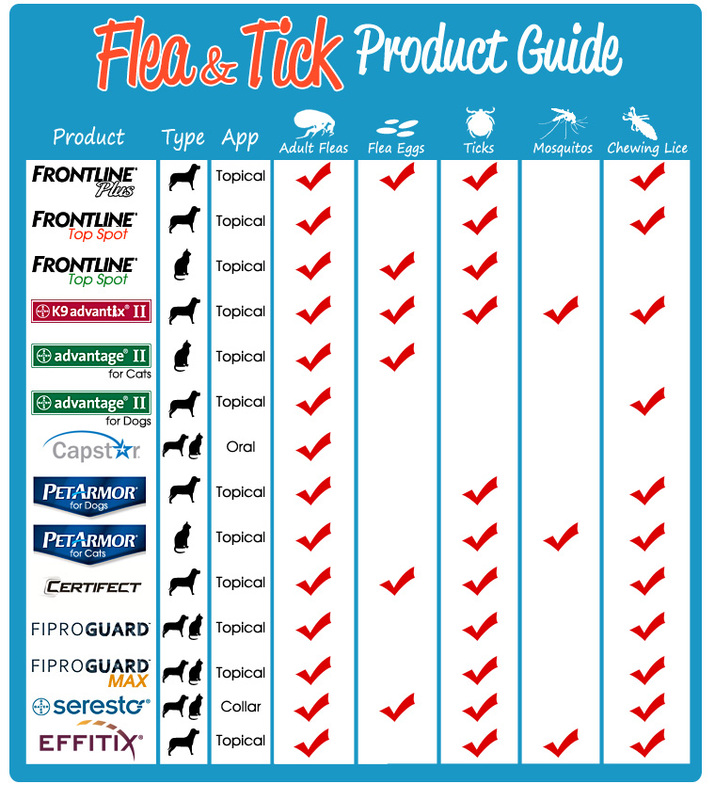 What's in Your Pet's Flea Medication? There are a wide variety of flea and tick medications out there to keep pets free of pests; however, a vast majority of these medications utilize the same active ingredients to repel and kill insects. There are four ingredients in particular that stand out in their near-ubiquity: fipronil, s-methoprene, imidacloprid and permethrin. Often, fipronil and s-methoprene are used in conjunction with one another; whereas, permethrin and imidacloprid provide an alternative pairing. Because of the contrasted use of a permethrin/imidacloprid pairing and a fipronil/s-methoprene pairing, we compare the four ingredients in a way that emphasizes this grouping. Please note that toxicity information is included for your benefit, though products that utilize these ingredients do so in small amounts that are incapable of harming pets or humans when used as intended. The vast majority (+95%) of users do not experience side effects associated with these ingredients and, of those that do experience them, many do so due to improper usage such as the consumption of a topical product or the application of an inappropriately large dose. Fipronil is an insecticide that is used to control a wide variety of pests. It kills insects on contact by debilitating the organism's central nervous system until death. The chemical structure of fipronil is more likely to bind to the nerve endings of insects than other animals, making it ideal for use in pesticides. That being said, excessive amounts of fipronil can negatively influence humans and other creatures if exposed to the chemical in a particular way. Though proper dosage is safe for most mammals, tests indicate that fipronil is toxic to fish and some invertebrates. It was also found to be very toxic to some birds, though other birds were almost completely unaffected. 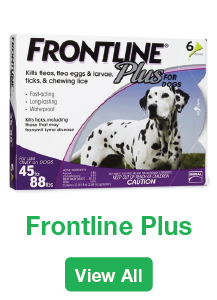 Though it is safe for topical application, it is important to handle fipronil with care. Humans risk unsafe exposure to large amounts of fipronil through skin contact, contact to the eyes, inhalation or consumption. It's safe to expose pets to fipronil when a product is designed for application directly to the skin and when done in the prescribed dosage. It is important, however, for humans to wash their hands after applying the product, as their hands might have contacted the pesticide. Direct short-term skin contact with fipronil can cause mild skin irritation; but, consuming fipronil can cause nausea and vomiting, dizziness and sweating, and headaches or seizures. The risk of exposure to fipronil also depends on the formula of any particular product; most medications only contain a small concentration of fipronil such that dangerous interaction is unlikely. Fipronil breaks down on soil within 125 days when exposed to sunlight and does not mix well with water, making it an environmentally friendly choice. Methoprene is a hormone that comes in two forms: r-methoprene and s-methoprene. S-methoprene is a growth regulator that acts as an important juvenile hormone in insects to prevent pupa and larva from developing into adults. While remaining in their juvenile form, the insects are unable to reproduce, breaking their life cycle. It is technically considered to be a biochemical pesticide since it does not directly kill insects with toxicity, but rather prevents them from maturing and reproducing. Humans can suffer mild irritation if s-methoprene enters their system via the skin or lungs. However, it is known to be safe to a wide variety of animals unless a particularly large dose (10g/kg) is ingested. When s-methoprene enters the body it is broken down quickly and then excreted, though it can be stored in the body in very small amounts. Its toxicity in fish varies from mild to severe and it is non-toxic to birds. 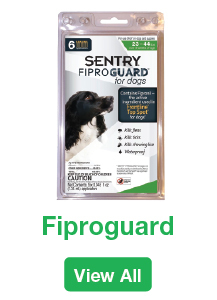 One of the most popular medications that utilize these ingredients is Frontline Plus for cats and dogs, and FiproGuard from Sentry also includes both ingredients. 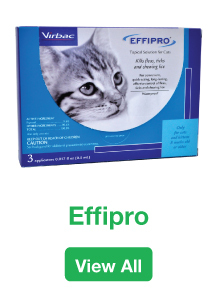 EffiPro for Cats includes fipronil but does not contain s-methoprene. Permethrin is a pyrethroid, a synthetic organic compound, that functions as a neurotoxin in insects. The chemical works by keeping sodium channels open for extended periods of time. These channels normally open and close in rapid succession in order to send signals, so keeping them open for longer slows the nervous system to a halt in select organisms. 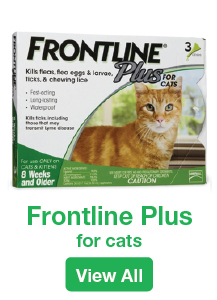 Through a different mechanism, it can also be particularly harmful to cats and fish when ingested. Cats cannot metabolize this synthetic pyrethroid, so it is important that they do not come into contact with pets that have been treated with the chemical. 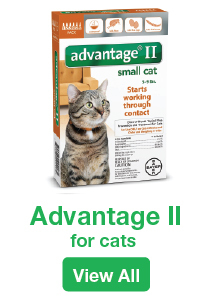 For topicals that contain permethrin such as K9 Advantix II, it is fine for your cat to come into contact with a treated dog 72 hours after the application. This being said, permethrin is minimally harmful to humans and dogs unless an excessively large amount is applied or ingested. Humans and dogs can have adverse reactions to permethrin exposure if exposed to an extreme quantity. Dogs might act oddly, flip their paws, twitch, or roll around on the ground if exposed to a high dosage; however, the product is safe for topical application when used properly. People and dogs risk exposure via inhalation and ingestion; if ingested, permethrin can be especially harmful. Animals that ingest permethrin can suffer from seizures and muscle tremors. Humans that have been exposed to permethrin might experience mild skin irritation or tingling. If ingested, people can suffer from vomiting, nausea, and pain in their throat and abdominal area. Inhalation might lead to irritation of the lungs and nose and can cause headaches, vomiting, and vertigo. Fish and other sea life are highly susceptible to permethrin; but, it is relatively non-toxic in birds. Imidacloprid is a neonicotinoid that functions as a neurotoxin. It acts on the insect's central nervous system by blocking a neural pathway, which causes a build-up of acetylcholine. Acetylcholine is a motor neurotransmitter used to control motion, so this build-up leads to paralysis and death in affected insects. Imidacloprid is made up of colorless crystals but has a mild, characteristic scent. Neonicotinoids are closely related to nicotine and were initially developed with the intention of creating a chemical with low risk for toxicity. Though the product is safe for animals and humans when used topically, ingestion and inhalation of imidacloprid can be dangerous. In humans, ingestion and inhalation of large quantities of imidacloprid can lead to vomiting, diarrhea, muscle weakness, and even death. Other more common and milder side effects include disorientation, agitation and sweating. These effects are also seen in animals that ingest or inhale the product, so it is important that application is performed somewhere the animal cannot lick. Though not much of the product is absorbed upon skin contact, when it is consumed or inhaled up to 92% of a dose can be absorbed. This is why it is critical to administer the medication correctly. Imidacloprid is toxic to fish and varies for birds depending on the species. It is also water soluble such that it dissolves in water. 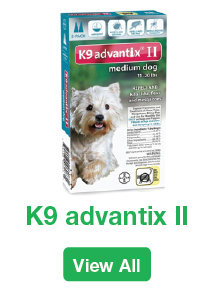 K9 Advantix II uses both imidacloprid and permethrin. 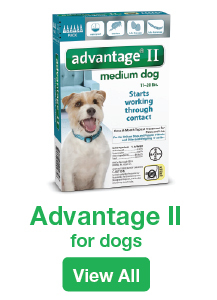 Advantage II uses imidacloprid but not permethrin and Vectra contains permethrin but not imidacloprid. There have been various studies done on the efficacy of medications that utilize fipronil and s-methoprene when compared to medications that contain permethrin and imidacloprid. One report cites that after a thirty-day trial, it was shown that permethrin and imidacloprid is the more effective combination with a statistically significant distinction occurring at the 28th day. Both medications were intended to last the full 30 days; the efficacy rate of the fipronil and s-methoprene combination fell to 77.56%, whereas the efficacy of the permethrin and imidacloprid group remained 98.43% effective. The less effective solution being tested contained 10% fipronil and 12% s-methoprene; the other soluton was composed of 10% imidacloprid and 50% permethrin. It should be noted, though, that formulas with lower concentrations of each ingredient have showed the opposite result. When the concentrations were set at 10% fipronil and 9% s-methoprene and the other medication at 8.8% imidacloprid and 44% permethrin, the fipronil/s-methoprene combination was found to be significantly more effective. There are a variety of medications for dogs, so it is important that you note the concentrations of these ingredients when comparing options for your pet. Additionally, some medications utilize different combinations of these ingredients, which have no direct comparison to any of the aforementioned combinations provided by clinical trials. 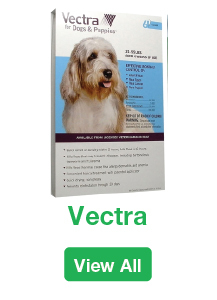 Effitix for Dogs, for example, contains both permethrin and fipronil. Though studies have determined it to be an effective treatment for sandflies in dogs, there are no studies that directly compare its efficacy to other formulations. Lastly, it is essential to ensure that the formula you are using is the proper one for your particular dog. Products have different doses based on the weight of your pet and a stronger dose may be harmful to your pet. Consult your veterinarian before applying these medications to ensure that it's right and that you apply the dosage correctly. For more on the differences between the medications discussed in this article, check out the chart below.